Readers, As mentioned in my pre-market analysis here, trading today was quite tricky. However the day ended with profits for me. I was also able to provide buy/sell alerts real time to my readers here. 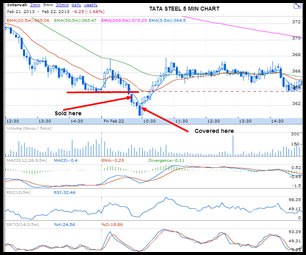 I alerted here to sell Tata Steel below previous days low. Tata Steel gave two points below days low, but bounced back only to face resistance at the critical level 368. Though Tata Steel went down, started moving up after hitting 360, this will be the next support going forward. SBI went below the critical level of 2200 and stayed there, technically was a good selling point, however the stock bounced back. Sensing the first danger, I covered immediately after the MACD gave positive crossover in 5 min chart. 2190 will be a good support going forward. As per my alert to the readers, I bought L&T above 1430, got 10 points. L&T quickly reversed its gains and continued to face resistance at 1440-42. Going forward this will be the resistance for the stock. 1090 was the critical turning point and the daily pivot as indicated in my pre-market analysis. I also alerted the readers to buy the stock above 1090. I was able to book 6 points. I kept an SL here at the last support of the day, and it was never hit. For Mondays trade 1085-90 will be the critical support.